What’s that I was hearing? Could it be? Yes, it could, and to be honest it was no surprise. Grumpy was engaging in weather-banter with the representative of the Royal Mail who was attempting to wring from him a signature to confirm delivery of our Olympic tickets. The Olympic ticket delivery system is a marvel of modern organisation. I have never been so updated with progress before. Yesterday an email that I nearly discarded as spam – “Royal Mail has received your item…” It sounded a bit like “You have won EuroMillions despite having never entered”. Then a text with the same warning to be in for the delivery. Then the delivery itself. Then a text telling me what had happened. And another email. The tickets had definitely arrived. So, with the prize in our grasp we hurriedly opened the envelope proudly emblazoned with “Tracked by Royal Mail”. Inside we found a purple wallet with our souvenir tickets. If they are souvenirs does that mean we can keep them forever? No-one’s going to take them from us or cancel them out by tearing off a corner or running a biro over them in that official way they do on the trains? Grumpy seemed more interested in the added extras, “What’s that? A travel card? You get a free travel card?” Like he’d never seen one before. Well, fair enough, really – a bit old skool now we have the magic of Oystercards. A souvenir travel card, perhaps? Once I had distracted him from the price (I had completely forgotten how much I ended up paying in that second round panic for tickets nobody could imagine wanting two months previously) we took a look through the contents of the envelope. There were the tickets and a guide to being a spectator, which pretty much involves getting there two hours ahead of time and submitting oneself to intensive security inspection. You also seem to get a GB official supporter sticker, sponsored by Lloyds TSB and a sheet of “pop out tags” that seem to offer the holder a strange photograph in the Olympic Park. You have to sign up on the BP website for them to “offset” the carbon emissions caused by your journey to the games. There is a video presented by Adam Hart-Davis to explain how carbon offsetting works if you think this seems to be like a magic solution to something that doesn’t seem that easy to solve. At the end of the video Adam observes that some people are sceptical about carbon offsetting, suggesting that it is about “lazy” people trying to throw money at a problem, but he doesn’t believe that. Well, you can watch the video and decide. Living in London, I would have used public transport to get to the games with or without a free travelcard. I am sure many people in the UK would do the same were efficient and affordable public transport available. Investing in public transport and making owning a car less desirable is surely a better way to go than trying to balance out the pollution they cause. 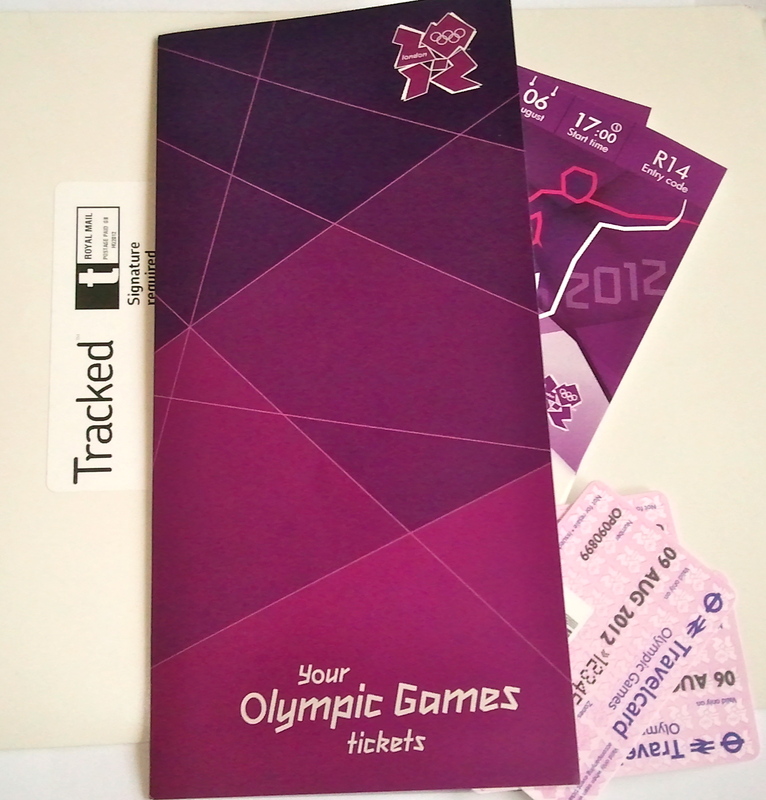 This entry was posted in Tickets and tagged BP, london 2012, olympic ticket, travel by Eileen Kennedy. Bookmark the permalink. The golden ticket! The other morning I went with Grumpy to pick up a package from the post office. A recalcitrant student hadn’t put enough stamps to cover the weight of his DVD he was sending – it had him giving a presentation on it (“And it was late!” Grumpy told an amused customer). There was somebody there picking up a cardboard envelope uncannily similar to the one I got. “I don’t know what it is!” he said to the man behind the counter. “That’s your Olympic tickets”, he replied. “Is it? I think it must the the volleyball ones”, he gushed, coming over quite giggly. It was a happy moment for us all. We saw someone else walking away carrying an object marked by the telltale purple tracking sticker. I said to Grumpy, “he’s got his Olympic tickets too”. “Has he?” Grumpy said, and smiled.